Step one: Ask your local oral surgeon to pull out your teeth, preferably intact, and to let you keep them. Tell them all about your crafting ideas, and maybe they’ll give you a few extras! Step three: Decorate! Let those creative juices flow all over you! 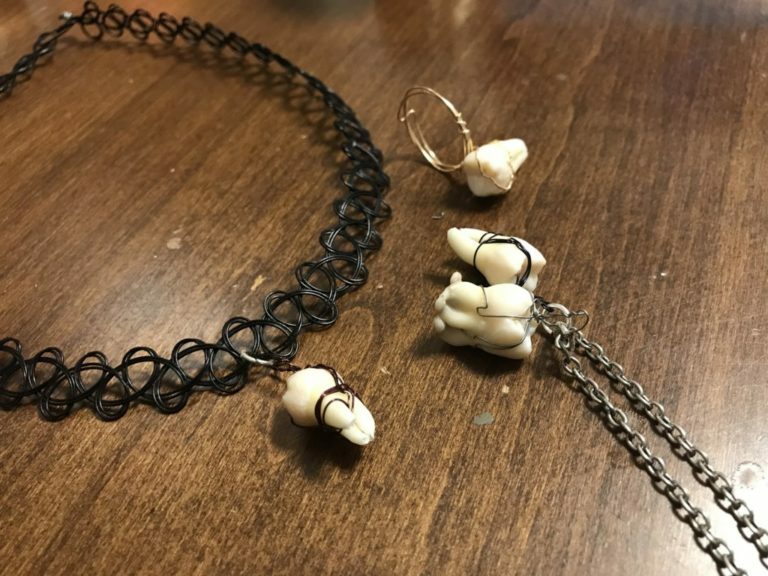 Here, I used crafting wire to turn my teeth into charms for necklaces, as well as a ring. The tools that come in any basic dissection kit are perfect for shaping the wire to your every need. It is imperative to keep in mind that this is the fun part, and to not let any societal expectations hold you back. My beautiful infant son James may have gone missing, but I’m here to share with you my favorite fall crafts that are also perfect coping mechanisms! Hanging this on your door will welcome autumn to the whole house! If only it was a home and not an empty shell, but decorating for the seasons helps with ‘leaving the past behind,’ as my therapist says. A classic craft for Fall Fun- cute and simple enough for any infant! James would have loved this, painting was his favorite activity. I can reclaim the small simple things, like painting, to normalcy. It will help me build a new life. Great for a doorstep, and will even cushion the fall of a sweet baby boy, if he could still play and run. But he can’t. James’ small hands would have made perfect little acorns… but I will never see them grow into mighty oaks. Maybe if I hung this festive owl by the crib, I would have remembered to lock the window. Oh god, James, this is all my fault. I can sometimes still hear his cry coming from his room… Some days, I can wake up and forget that he was taken away from me, but it all comes rushing back when I go to feed him. I painted his nursery yellow. Yellow is supposed to symbolize security and happiness. Now it just mocks the emptiness in my heart. Every day is a living hell rife with grief and guilt. With a little paint, these leaves make beautiful prints after you press them against the paper, just like I used to press my boy against my heart. *The Kumquat content is for entertainment purposes only, and it is, by no means, meant to be offensive. If you don’t know that we’re a fake/satirical news show, go back to school.